The federal government, through the Federal Motor Carrier Safety Administration, defines a bus as any vehicle that carries nine or more people. That includes city buses, school buses, tour buses, airport shuttles, high-capacity vans, and more. Because of their high carrying capacity and large mass, buses can be particularly dangerous if they are involved in an accident. Especially because many buses do not have seatbelts, airbags, or other safety features that can be found in smaller vehicles. They are long and heavy, which means they take longer to get moving and have much longer stopping distances than small vehicles. They are tall and top heavy, making them easier to tip or rollover in a bus accident. They carry a lot more people than smaller vehicles, so if they are involved in a bus crash, there are a lot more people who could potentially be injured. Buses carry many standing passengers, and those who are sitting probably don't have seatbelts. Buses stop often alongside busy roads, increasing the risk of people who are getting on and off the bus. Because of the mass of the bus, the occupants of the bus are less likely to get injured than people in a vehicle struck by the bus. Because of the bus' height, bus passengers are less at risk of getting injured from a direct hit by another vehicle. Bus drivers receive special training that motor vehicle drivers don't get. Buses fall into a special category of transportation, like trains and airplanes, called common carriers. That means they provide transportation to any paying member of the public. More importantly, it means legally they owe a higher standard of care to their passengers than private carriers. That makes the legal standard easier to meet in a case against a bus company because whereas private drivers are expected to exercise reasonable care when driving, bus drivers are expected to go above and beyond what is reasonable and extend the utmost care to their passengers so they are never put in a position where they have to seek the advice of a bus accident attorney. Many buses are privately run, but others are public, like school buses or public transit like that provided by the Regional Transportation Commission. Because the government enjoys constitutionally protected sovereign immunity, lawsuits against the government require special steps to get over the sovereign immunity. The statute of limitations in these cases (the timeline to file a case) are often shorter, and there are obstacles to overcome before you can file. These are the types of pitfalls an experienced bus accident attorney can help you avoid. Safety first. Get to a position of safety, and if you're in a position to do so, help others do the same. Call 9-1-1 if there are injuries. Don't count on anyone else to call. Listen to the bus driver and follow his or her directions. The bus driver should have the safety of the bus' passengers top of mind. Remember the common carrier has a heightened duty of care. If you are in a vehicle that was in an accident with a bus, get out of the road and out of the way of other vehicles. If you are in a position to do so, collect names and contact information for any witnesses to the bus accident. Start with the witnesses outside the bus, as they're going to leave first and be the hardest (if not impossible) to locate. Take photographs of the scene from as many angles as possible. Be safe as you do this. Give your statement to the police, and get the officer's name, department, and badge number. Make sure they incorporate your statement into the report. See a doctor, even if you aren't transported by ambulance, and even if you don't think you're injured. Better safe than sorry. Don't talk to any insurance adjusters or lawyers without your bus accident lawyer present. Call the bus accident lawyers at Parry & Pfau. 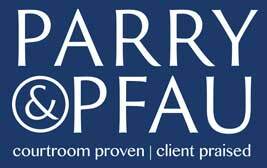 The school bus accident attorneys at Parry & Pfau, who are also city bus accident attorneys, will get a police report for you, and we'll pursue your case at no cost to you. Call for a free and confidential consultation.